I grew up in Quebec. My father, an orthopaedic surgeon, influenced my decision to follow in his path. I attended the University of Ottawa medical school, then moved to the United States for my residency. 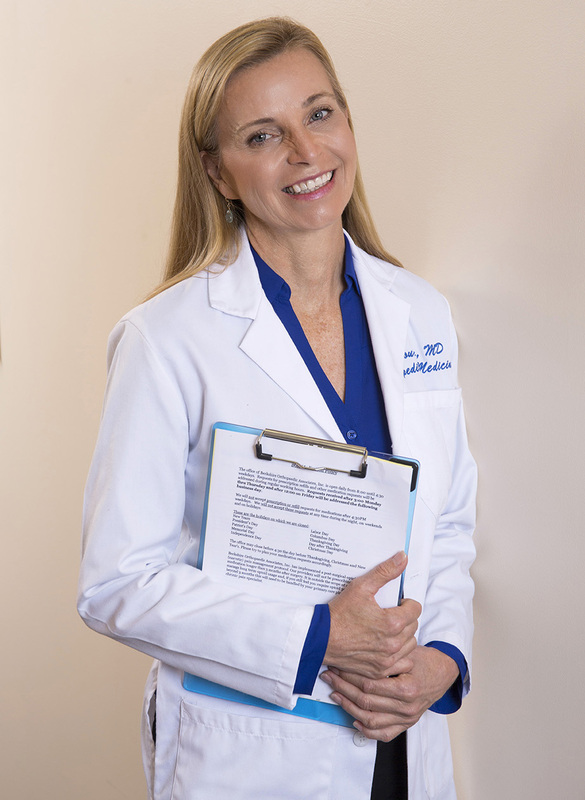 I trained at the University of Florida and was the first woman to graduate from an orthopaedic surgery program in the state. Upon completion of a fellowship in total joint replacements and specialization in sports medicine, I joined my father’s practice in Florida, where my parents had relocated. We enjoyed a great working and father-daughter relationship. Twelve years later, I moved to the Berkshires and transitioned to a non-surgical orthopaedic medicine practice. My work focuses on ways to maintain and regain health so patients can avoid unnecessary surgery and remain active. I incorporate conventional medicine and offer more progressive options in the treatment of orthopaedic conditions: sports injuries, arthritis and osteoporosis. I hold regular lectures for our community. After more than 20 years of surgery, my practice evolved. I chose to focus on methods to maintain and regain health in order to eliminate unnecessary surgery. Studies over the years have revealed that non-operative measures offer better knee pain relief than arthroscopy. The latter surgery actually accelerates joint deterioration. I work with men and women to develop a healthy knee program. I help my patients to diagnose early bone loss and avoid fracture. I teach patients to improve their fitness and remain active. I use supplements and some pharmacologics promote health and vitality. I address menopausal symptoms with diet, supplements and bio-identical hormones. Hormones not only eliminate menopausal symptoms but stops bone loss. ORTHOPAEDIC MEDICINE: Orthopaedic physicians diagnose and treat ailments affecting muscles, bones and joints, treating sports injuries and degenerative diseases. BHRT significantly reduces peri-menopausal and menopausal symptoms. In addition to helping with symptoms, hormone replacement therapy may also reduce your risk for diabetes, bone loss, tooth loss, and cataracts. There’s some evidence that it can help improve skin thickness, hydration, and elasticity, and even reduce wrinkles. In one study, women with breast cancer who underwent BHRT had relief from treatment-related symptoms such as migraines, incontinence, low libido, and insomnia. BHRT greatly improve well-being and quality of life with no increase of cancer risk. There may also be side effects that accompany BHRT, particularly in the beginning as your body adjusts to the hormones. BHRT must be adjusted to each woman and her specific symptoms. The goal is to identify the lowest effective dose.